Lol raptor, and not just because of the so-called wings. This is actually based on a museum mount, but it really does look like they should have included a bicycle. Not too happy with the arm plumage though, even if I am a little unsure about the full wings some reconstructions have. Most extant ground birds don’t have a lot on their arms, so why would a creature that uses it’s forelimbs for handling prey? 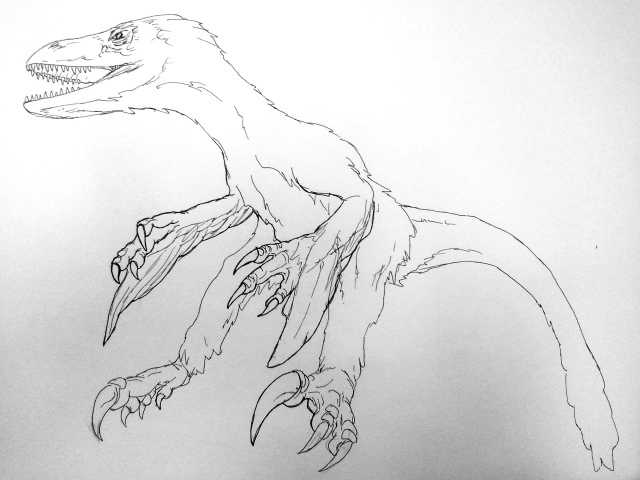 This entry was posted in Quick Desksketch and tagged bicycle, deinonychus, Dinosaur, extinct by Anthony. Bookmark the permalink.